April is National Child Abuse Prevention Month. This month and throughout the year, the Diocese of Laredo encourages all individuals and organizations to play a role in making our community a safe place for children and families. By providing educational resources to staff, and all volunteers, the Diocese of Laredo helps ensure that adults have the knowledge and skills they need to keep children safe and identify the signs of child abuse and neglect. 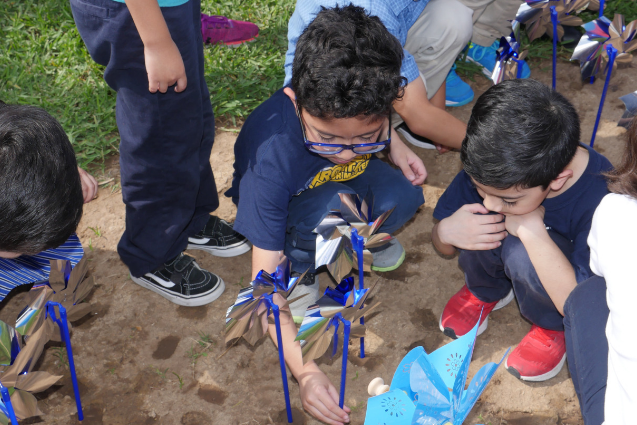 On Friday, April 8, 2019 Bishop James A. Tamayo and the Diocese of Laredo staff, accompanied by their children and grandchildren, carried on a diocesan tradition of planting the Child Abuse Prevention Pinwheel Garden. At this awareness ceremony, which is under the administrative direction of the Human Resources Department and the Safe Environment Office, diocesan staff and their children planted blue pinwheels into the ground of the front lawn of the Diocese of Laredo Chancery building. Shortly thereafter, cupcakes and other goodies for the children were served. The color blue is to raise awareness for National Child Abuse Prevention Month. Photos from this event can be found on our Facebook page.